When a potential client asks for what you have to offer, what do you do to make a great impression? Besides using fancy words, what else do you do to seal a deal? I bet you wouldn't want a response like "let me think about it". 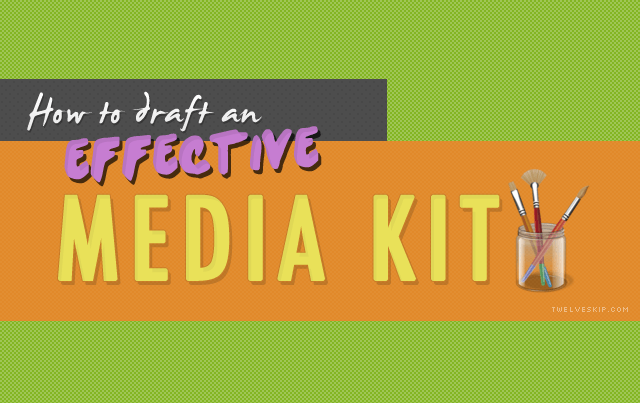 A simple media kit that makes an impact can definitely help you close a sale faster. The client is more likely to take you seriously if you create a killer first impression. Your media kit is like your resume where you introduce what your brand is all about - where you share your story, your services, your solutions, your work samples, testimonials, and the companies you've work with before. In this post, you'll learn how what media kit is, why you should use it and how you can create an effective one. Read on to discover what it's all about, why it matters, and how you can make your own and thus enjoy the wonderful benefits that go with having one. Stylish + professional media kits? Click here to get one! I. What is media kit? In a digital world, media kit is a collection of information about your website that will help people know the who, what, where, when, how, and why of your company. A media kit should be concise, but informative at the same time. A media kit can take a form of PDF, Word, videos, audio, images, product sample or the combination of these. II. Why use media kit? Increase level of professionalism – given that you made an impressive media kit, you’ll be perceived as someone who is credible, reliable, and trustworthy. Potential clients will take you more seriously when you have a media kit. Introduce your brand more effectively – a media kit is a summary of who and what you are. This means that you can easily give your clients a general glimpse of the competitiveness of your company. Need an easy-to-edit media kit template? Check out this post for elegant media kit templates! Your media kit is as effective as its content. So follow these tips for better media kit creation. Treat it like a business card or resume. Keep it short but informative; 3-10 pages of media kit is ideal. Make it uniform. If possible, use the same color, text, and design used in your website. Limit font style to 2; too much variation in font style will mess your design. Make it interesting; avoid using long paragraphs, but instead use text boxes, images, bullets, subheadings, and titles. Update as needed; make the necessary changes and keep information up to date. Never spam people; be professional when approaching other companies you like to work with. Never misrepresent information; identify sponsored posts. If this is your first time creating media kit, it’s important you start with the basic, then add other content you deemed to be essential. Logo – Make sure to add a memorable logo that represents what your business stands for. About Your Site – In this section, you need to include an introduction of your website. Mention the name of your website, its background, and your primary market. Include who, what, when, where, how, and why of your website. Staff Biography – Add head shots or short biographies to further improve your credibility. You may include experience, competitiveness, skills, knowledge, and expertise of your staff. Target Market – Include the niche and topics you normally cover. Specify if you’re looking for giveaway posts or banner ads. Be upfront to what you are capable of and be honest as much as possible. The client will surely appreciate it if you can provide information that will be useful both now and in the future. Displaying your rates is optional since your pricing may vary due to various reasons depending on the type of services you provide. I personally don't like to expose my rates unless it's a repetitive job, I prefer creating custom quotes based on the required efforts and time. It all depends. So if you're comfortable with your pricing, you can include them. You can also include promos, deals, and discounts as well so that your potential client will be more interested. Your media kit is something you use to sell your product or service. So it’s crucial that you can convince a client that you have something useful or relevant to their brand. Your primary goal is to lead them to the realization that they’ll become a better brand with your help. To further improve your image, you may include whom you worked with before. It’s big plus if you can cite successful previous and on-going projects. If you have any recognitions, awards, credentials, accomplishments, and distinctions, then by all means, include them. Before you can completely convince a client to work with you, the claims you have made should be backed-up with concrete and irrefutable proofs or statistics. So, under the audience section, you need to include your blog statistics and reach. Include your site information specific to your site from Google Analytics Traffic (such as page views and unique visitors), Google Page Rank, Alexa Rank, and Klout. Another statistics you need to mention are the social media followers, number of subscribers, and demographic of your audience. Portfolio can either make or break your media kit. You need to make sure you create a compelling portfolio. Therefore, you need to be specific and include sample of your past projects. In this case, photos can be very effective in conveying your level of professionalism. For example, if your website is about photography, showcase your best shots. The FAQ sheet includes questions that are frequently asked to you along with the answers. Make sure you include important questions that are vital to be answered. What people say about you will exponentially improve your credibility and the quality of your services. Include policies, terms and conditions surrounding your services. You may add information about concrete steps on how other clients can work, advertise, and connect with you. Be certain as well to make print-friendly designs of your media kit. Make your media kit available in PDF file. V. Where to Get Media Kit Templates? I've created some media kit templates that can be edited using Microsoft word easily. Click here to access them on a separate blog post. Before we end our discussion, let me give you some of the wonderful examples of media kit. The Busy Budgeting Mama – a media kit about being a mom and how to be successful in motherhood. Her and Nicole – a personal lifestyle media kit that seamlessly display essential website information in a creative way. The Art of Simple – simple, but elegant; this media kit is definitely a great epitome of what a media kit should look like. Go ahead and check these visual examples on my Pinterest board. Follow Pauline C.'s board Media Kit Design Examples on Pinterest. Take time to explore more information about media kit and how it should be done. This strategy will absolutely help you increase your leads and sales with the use of media kit. Give it a try and see where media kits can take you.